k-rated: First Official Trailer for Marvel's Thor! The first thing that pops into my head when I think of Thor is Sarah Anderson's obsession with him in Adventures in Babysitting, and it makes me laugh. But after seeing this trailer the laughs are put to rest with "aw." This movie looks awesome! Paramount finally debuted their first official trailer for Marvel's Thor, directed by Kenneith Baranagh, and starring up and coming actor, Chris Hemsworth as the God of Thunder. You might recognize him as George Kirk in 2009's Star Trek. The trailer is a must watch, even if you're not familiar with this superhero. I'm sure it will be another epic comic-book hit too. The star-studded cast also includes the likes of: Natalie Portman, Kat Dennings, Anthony Hopkins (who I love btw) as Odin, Idris Elba, Stellan Skarsgård, Ray Stevenson, Rene Russo (she hasn't been in anything in a while) and Tom Hiddleston as the mysterious Loki (LOVE Loki!). Enjoy! 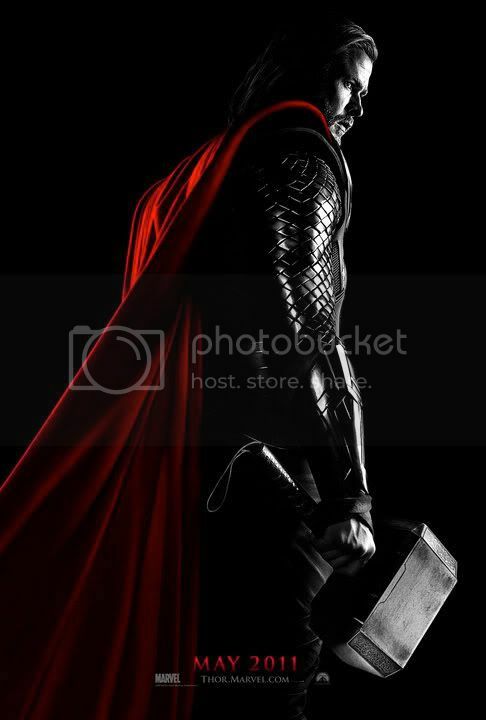 Marvel's Thor is directed by British actor/director Kenneth Branagh, who previously directed Shakespeare adaptations like Much Ado About Nothing and Hamlet, as well as the films Love's Labour's Lost, The Magic Flute and Sleuth. The script was written by Ashley Miller & Zack Stentz (Agent Cody Banks, "Fringe") and Don Payne (My Super Ex-Girlfriend, 4: Rise of the Silver Surfer) from a story by J. Michael Straczynski and Mark Protosevich. Paramount is bringing Marvel's Thor to theaters in 3D on May 6th, 2011. This summer is heating up with some great summer blockbuster. Can't wait! Let the age of gods reign with glorious thunder.